My love of perogies continues..... This time I'm not making perogies from scratch, as I did HERE. I'm not using them as a pizza topping, as I did HERE. This time, I'm dumping some frozen, purchased (gasp!) perogies into an 8x8 inch baking dish. Then I'm topping them with a few not so healthy but oh so delicious ingredients, including BACON!! Lastly, I cover them with aluminum foil, and bake for 40 short minutes for a perfect little comfort food dinner. 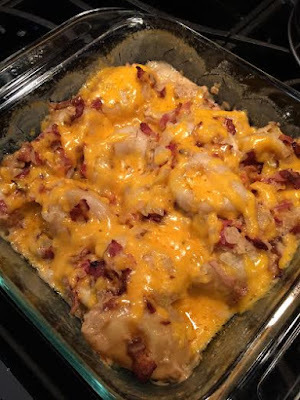 -1/2 cup shredded cheese (optional). But who doesn't like cheese? Seriously. -Spray a glass 8x8 inch baking dish with cooking spray. Place perogies in the baking dish and set aside. Don't worry about arranging them nicely....just dump them in! -Fry diced bacon until crisp. Drain, reserving 1 tbsp of drippings. Sprinkle bacon over perogies. -Fry onions until slightly softened (about 5 minutes) in reserved 1 tbsp of drippings. Sprinkle onions over perogies and bacon. -Combine half and half, salt, and pepper. Pour over perogy mixture. Cover tightly with aluminum foil and bake in a preheated 400F oven for approximately 35 to 40 minutes. Uncover and sprinkle cheese on top. Bake for an additional 3 to 5 minutes, until melted. This would also be amazing to garnish with some sour cream and chives (to make it almost like a baked potato!) Adding some dill to the half and half mixture would also be something worth trying.